A Couple in the Kitchen: Facebook Video Recipes - Like? So I finally joined Facebook. I gave in and joined the 21st century. And instantly, I was hooked. The connections! The memes! The 30-second video recipes! Like! Like! Like! Then I tried one of those recipes for the first time. 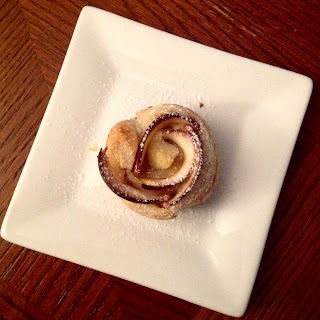 It was this one (Apple Roses), and I decided to make them instead of the usual apple pie I make for Chris's birthday. This picture is one of twelve - the other 11 aren't nearly as pretty. (Insert heavy sigh here). Mistake #1: Relying solely on the one video. While the ingredients appeared as captions within the video, there were no measurements or actual directions. What can I say? That video made it look REALLY EASY, and I have a lot of experience in the kitchen. I got cocky. Mistake #2: Ignoring my intuition. I kept wondering, how are these apple slices, even super thin ones, gonna' roll up so easily inside the pastry without breaking or making holes in the dough? Answer? They aren't. Mistake #3: Trying to bake puff pastry at 330F for 30 minutes. More like 375F for 35-40 minutes. Unless you like to eat soggy, slightly raw pastry dough. 1. Do more research. Poke around the Internet, get clearer directions and/or tips from other people who have tried the recipe. 2. Listen to your inner chef. Soften the apple slices by simmering them in water for a few minutes before trying to bend them without breaking them or the pastry. And definitely turn the oven up, preferably from the beginning of the cook, not 1/2 hour in when you realize they aren't cooking. 3. Get real. It never looks as pretty in real life as it does in the video. And that's OK.
To sum up: There's a lot of great stuff on Facebook. So, yes, I still LIKE! but I shall proceed with more caution in the future. I advise you to do the same.